Spirit photography became popular in the 1860's when photographer William Mumler happened upon double exposure, and marketed double-exposed photos as "spirit photos." The whole thing was a gaff, but the idea was that the photographs showed the living person and in the background would be an image of a dead loved one's "spirit." 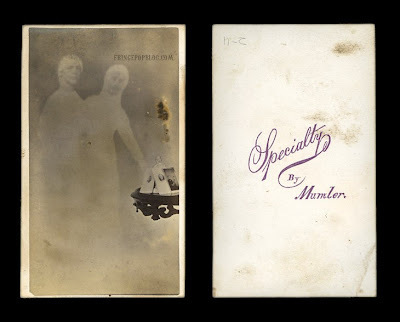 To obtain images of "spirits" that looked like the person's loved one, Mumler would have the subject bring in a photograph of their deceased loved one or otherwise ascertain what that person looked like. Then, he would search through a bunch of photos of random people and find the best match to use in his double exposure process. Mumler even took a famous photo of Mary Todd Lincoln in which honest Abe's "spirit" is in the background. Mumler was discovered to be a fraud when someone recognized living people being portrayed as the "spirits." A huge trial ensued in which even P.T. Barnum, great gaff master himself, testified against Mumler. Despite all the hoop-la, Mumler was still found not guilty. The CDV photograph shown above is an original Mumler "spirit" photo. People who couldn't appear personally in Mumler's studio would send photographs, along with lots of cash, to him. Mumler would then take their photographs and place them on the table shown in the photo. He would then add in the spirits from his stock of photographs of random people, easily finding the best match by comparing photos of the deceased loved ones with his stock of photos. What a racket! And a profitable one at that.